Let us take you surfing! From first timers, to surfers who want to take it to the next level, a one-on-one lesson is a great option. All ages and abilities welcome! Surf Camps are a blast and operate every Monday - Friday all summer! P.s. Parents, did you know a surf camp could be a tax write-off? Have a small or big group? We got you covered. Whether you're a group of friends, family, bridal party, school, company and more, we'd love to get you all in the water! 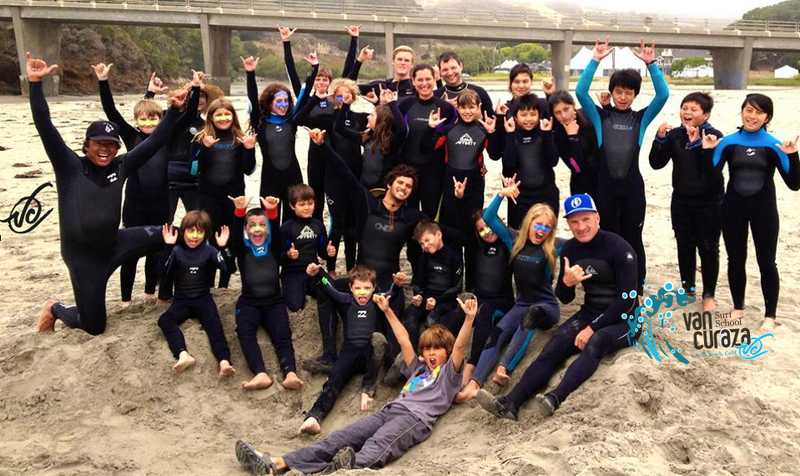 Any Age, Any Ability, Anyone..
Van Curaza Surf School is all about SURFING, SAFETY, and FUN! VCSS is the premier surf school serving the central coast of California. Founded and run by local legendary waterman Van Curaza, VCSS is passionate about sharing the stoke of surfing and beauty of the ocean. Since 1979, Van has been teaching surfing and ocean safety, along with community and environmental awareness. In addition to teaching hundreds of people his passion, he has also founded a successful non-profit organization called Amazing Surf Adventures, which teaches wounded military to overcome challenges one wave at a time. From first-timers and beginners, to expert surfers and differently-abled individuals, we invite anyone to enjoy a surfing experience of a lifetime! With us, your dream to surf will be fulfilled! Surf Camp Fun in Avila Beach! I had 3 thirteen year old boys and one eight year old have a great lesson from Van! They all had a blast and now want to grow up to be surfers. Office staff was very flexible with our last minute plans and overall it was a super positive experience. Highly recommend!!! My 5 year old learned to surf in her first 30 minutes on a board. The staff was very attentive to all students and incredibly caring. We will be back next summer for our second round of Surf Camp! Stoked mom. It's worth the drive from Florida! Van and his instructors are the bomb!! An awesome mix of fun, excitement, learning, and safety. Truly caring and vested. Totally went the extra mile.